Immediately after receiving the alert, an international research team led by Raffaella Margutti (Northwestern University) leapt into action and began observing the unusual source across the electromagnetic spectrum – at X-ray, optical, infrared and radio wavelengths. Telescopes around the world contributed to the effort using spectroscopy to decode the nature of the source. Among the telescopes that contributed was the Southern Astrophysical Research Telescope (SOAR) in Chile whose instruments obtained spectra of the Cow. With spectra, which spread out the light in the form of a rainbow, astronomers could quickly confirm that matter was expanding from the object at up to 10% the speed of light. Régis Cartier, who made the SOAR observations, said, “Almost from the very start I realized that this transient was special. It was fast, blue and bright, different from any supernova seen before. I dropped everything else I was working on to focus on understanding this event.” In addition to the SOAR telescope, other telescopes at NSF’s CTIO and KPNO imaged the object and contributed to a broader picture as the Cow faded away. Because the collapsed star was surrounded by a relatively small amount of debris, the team was able to peer through the debris and get a glimpse of the object’s “central engine.” This rare event will help astronomers better understand the physics at play within the first moments of the creation of a black hole or neutron star. The results were presented today at this week’s meeting of the American Astronomical Society in Seattle, Washington. 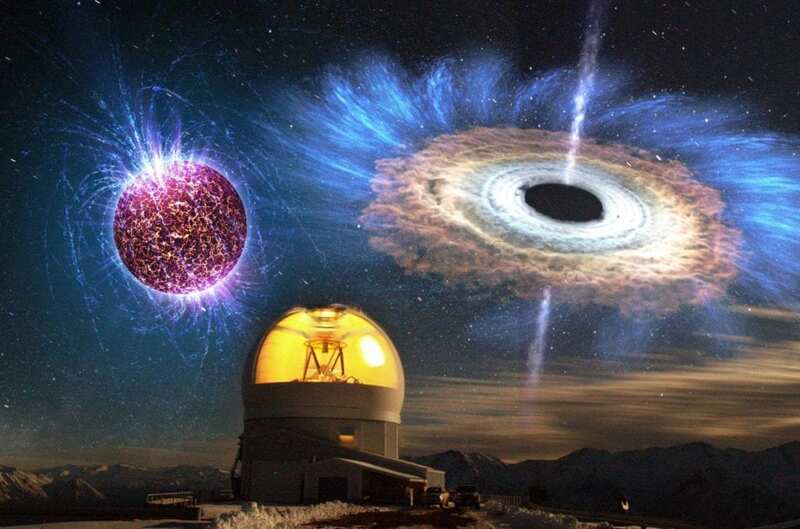 “We think that ‘The Cow’ is the formation of an accreting black hole or neutron star,” said Giacomo Terreran (Northwestern University), who led the CTIO observations. “We know from theory that black holes and neutron stars form when a star dies, but we’ve never seen them right after they are born.” This event may represent a new class of objects within the category known as fast luminous transients. Although a supernova like the Cow has never been seen before, Cartier expects that astronomers will detect larger numbers of such rare events in the future. Now that surveys are searching for sources that vary on a wider range of timescales, “we’ve already discovered a whole family of fast transients that we didn’t know existed,” noted Cartier. The SOAR telescope is gearing up to help us understand these new events. Said Dr. Jay Elias, Director of SOAR, “The SOAR telescope was designed from the start to provide flexible instrument configurations, allowing it to respond quickly to events like this. There are many astronomical surveys observing interesting transient events, as well as other events, such as last year’s kilonova detected by LIGO, which was also observed at SOAR. Very soon, there will be even more interesting transient events from the Large Synoptic Survey Telescope (LSST) and other large-scale survey telescopes.” The LSST is a new telescope being built on the same mountaintop as the SOAR telescope with major funding from NSF: it will conduct a 10-year survey of the sky with special emphasis on transient events.